Curling has been an official part of the Winter Olympics since 1998. Naturally, now that we’ve reached its 20th anniversary in the international spotlight, fans and athletes must look inward and consider whether or not its rules need reworking. Are the competitors being pushed hard enough? Are viewers entertained by the event? Is anything missing from Olympic curling that would make it a more complete—more exciting—sport? The answer, as with most things, is that it could probably use some cats. A rare clip of the inaugural Cat Curling event, back from the prehistoric era of 2006 internet videos, shows that there’s good precedent for the revised form. Though mysteriously scrubbed from official broadcast archives and absent from the ongoing Korean games, supporters are still been hard at work lobbying for its return. In the meantime, Olympic hopefuls have been inspired to submit footage of their own athletes deep in training. Here we see a variation involving a shoe box and linoleum, which recreates the conditions of keen ice and allows the furry stone a brisk back line to hog speed. The “barefoot marathon” version of the sport, though, has more adherents. 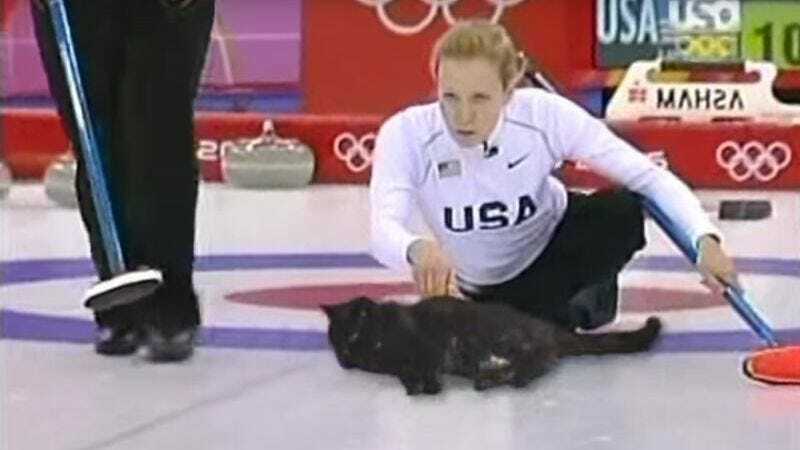 Likely to supplant tool-assisted cat curling as the dominant form, supporters praise the purity of play as the living, purring rock interacts directly with the ice. Whichever version finds favor with the International Olympic Committee, it’s thrilling to see a sport evolve in our own time. Complacency is the enemy of competition, applying to athletes and rule keepers alike. If curling is to maintain popularity in decades to come, we have to be willing to adopt bold new directions for the sport. The failure of cat luge, cat giant slalom, and cat figure skating to achieve widespread support in the past can’t be seen as a deterrent, but as a learning experience. And once curling has been reworked, it’s time to look toward the Summer Games. First up for consideration? Gymnastics.